DAYTON, Tenn. – The Bryan College volleyball team hosted fellow Appalachian Athletic Conference school Bluefield College (Va.) on Saturday afternoon and battled in three close sets before the opposing Rams took away the Lion’s chance at their first conference win of the season with the sweep 25-20, 25-21, and 25-21. Only two days ago, Bryan took part in a back-and-forth bout with AAC rival Tennessee Wesleyan University during their conference-opener but came up shy 2-3. This leaves the Lions at 3-7 overall and 0-2 in AAC play, still in search of that first conference victory. Bluefield on the other hand, registered their only AAC triumph so far this season, improving to 3-5 overall and an even 1-1 in conference play. As a team, Bluefield led on the offensive end with a .216 attack percentage compared to Bryan’s .066. The Rams charged ahead for 45 kills, while the Lions trailed with 27. The blue and red squad had a duo reach double-digit kills. Bryan’s kills leaders were Anna Owens and Mariah Dunlop, as each smashed six kills apiece. Rebecca Camacho, Janie Smith, and Jessi Towe followed with three kills, respectively. Dunlop carried a notable .333 attack average through the three sets. Sidney Pierce collected a team-leading 12 assists, followed by Jennifer Keck with six and Veronica Salas with four. Camacho had three serves that Bluefield was unable to return, going down as aces, which led the team. Rheagan Kean scooped up 12 digs for a team-high, and others to help were Macenzie Krause with eight, Pierce with six, and both Paige Randolph and Dunlop who chipped in four digs apiece. Bryan out-blocked Bluefield 2-0 with block assists from Owens and Camacho and a solo stuff from Towe. The Lions allowed the Rams to gain an early edge, scoring the first four points of the opening frame. An attack error by Bluefield provided Bryan with their first point, but back-to-back kills pushed the Rams in front 6-1. A kill by Dunlop helped spark a rally and get the Lions back into the contest when an ace by Camacho, kill by Randolph, and two more consecutive aces from Camacho evened the count 6-6. Despite Bryan’s attempt to gain control of the lead, Bluefield took advantage of two errors by the Lions to get back on top. 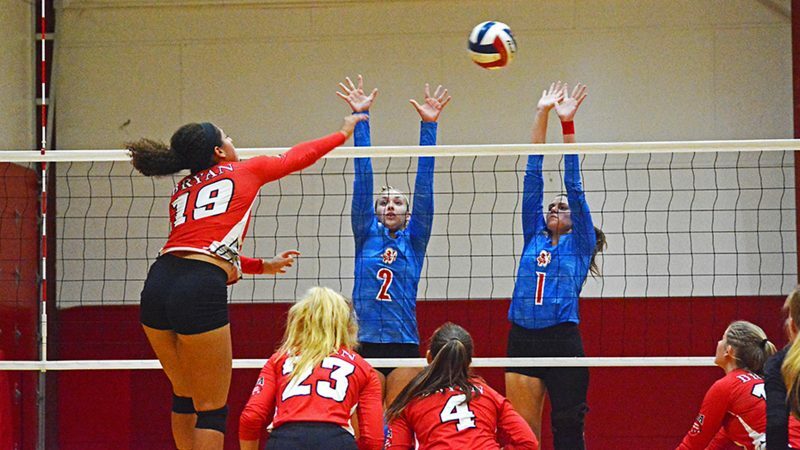 While the Ram’s largest lead would only grow to five points, the Lions wouldn’t be able to tie the set again and charted behind until Bluefield went ahead 15-10, 18-16, 22-20, and eventually sealed the stanza 25-20. Once again, a near repeat of the first set, Bryan offered Bluefield a 4-0 lead to begin set number two. A pair of errors by Rams broke the silence for the Lions, cutting the deficit to 2-4, but Bluefield bounced back with five points to keep Bryan at bay 3-8. At the midway point, the Rams led 15-10 and looked to end all hopes of the Lions with four unanswered points for a nine-point cushion at 19-10. While the push came late, Bryan still made the set exciting with a 10-3 run, slimming the gap to two points at 20-22. Bluefield surrendered only one point, coming off a kill from Randolph, as the Rams led 2-0 in the match with a 25-21 second set score. A different start to the final set helped the Lions finally catch a glimpse of their first lead of the day. Owens used an assist from Salas for the first point of the frame. Salas set up Smith for the second point, pushing Bryan in front 2-0. The closeness of the set was seen in the seven ties and five lead changes that occurred, with both sides tying at 2’s, 3’s, 4’s, 9’s, and 10’s. A pair of attack errors by the Lions and a successful kill by the Rams gave Bluefield a 13-10 lead. Bryan fell behind by as many as four at 13-17, but an attack error, a long rally that ended with a put-away by Emalie Hicks, an ace by Kean, kill by Dunlop, and another attack error by Bluefield allowed the Lions to level the count 18-18. On the next point, Bryan used a Dunlop kill to pull ahead 19-18, but it would be the last time the Lions would lead, as Bluefield allowed only two more points to the Lions before capping the set 25-21 and the match 3-0. Up next for Bryan, the Lions will take on the Montreat College Cavaliers (N.C.) in their first conference road match of the year with a scheduled start time of 6:30pm on Tuesday, Sept. 11.